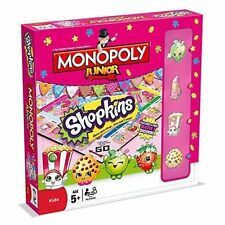 1 product rating1 product ratings - MONOPOLY - Perfect Family Game - Choose from 70+ Special Editions! 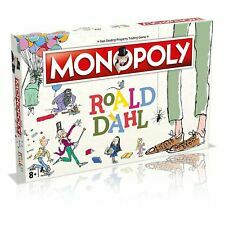 In this special Roald Dahl edition of MONOPOLY players tour their favourite characters and locationsfrom the most beloved Roald Dahl stories. From Miss Spider to the Twits, to the Giant Peach andCrunchem Hall, players can invest in Willy Wonka factories and build chocolate empires across thestrangest of locations. 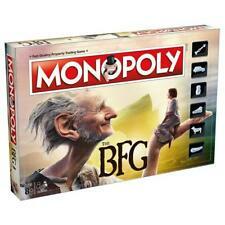 This unique and special edition MONOPOLY game will delight every RoaldDahl fan’s phizz-whizzing imagination. All aspects of the game have been customised and feature theiconic illustrations of Quentin Blake; including bespoke tokens, custom gameboard, cards,MONOPOLY money and more! The unedited version is right next to it. Winning Moves Harry Potter Trivial Pursuit Game (21289). Travel edition. Condition is Used but complete. Dispatched with Royal Mail 2nd Class. LET THE VIKING AGE BEGIN! Ragnar Lothbrok, disenchanted with his chieftain's progress, decides to cross the oceans by boat and discover new, richer civilisations. Now it's your turn to engage in combat and seek to conquer this new world alongside him. Top Trumps Match has loads of Nintendo cubes and characters. Open the Game Grid and see if you can make a row of 5 matching Super Mario Images. Will you get the character you need? Will your opponent spoil your chances? Will you take the Match with the special Top Trumps cards? It`s great for strategy, memory and recognition and with the all-in-one carry case, you can take Top Trumps Match anywhere! Click here for more details. This edition know longer in print. Usagi`s friend Rei has been plagues by disturbing versions of the Apocalypse, just as a new enemy appears in the city. The maniacal Professor Tomoe, leader of the Death Busters, has been targeting innocent citizens in a search for three special pure heart crystals. Usagi is prepared to confront this dangerous new foe, together powerful new Sailor Guardians who are already seeking the crystals.In this special Sailor Moon edition of Monopoly, you`ll tour all characters of the beloved anime Sailor Moon S.Own the four talismans/weapons and receive strong eternal items. Love and Friendship cards might reward you for fights against the villains or bing an unexpected surprise. Buy, sell and trade with... Click here for more details. Winning Moves Harry Potter Trivial Pursuit Game (21289). Condition is Used. Dispatched with Royal Mail 2nd Class. 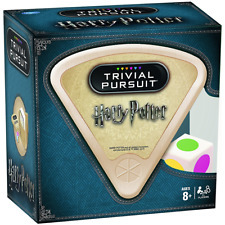 This Trivial Pursuit bitesize edition contains 600 questions based on the Harry Potter films, some of which would challenge even the smartest of wizards! Test your trivia from the following topics: The Dark Arts, Hogwarts, Magical Spells & Potions, Magical Objects, Magical People and Animals & Magical Creatures. The handy game requires no board and can be carried around in its bite-size wedge case. Box Contains 102 x Card Deck 1 x Die 1 x Bite-Size Wedge Case A fellow student has seemingly vanished from the famous School of Witchcraft and Wizardry - and it is up to you to solve the mysterious disappearance in Harry Potter Cluedo. Monopoly Rick and Morty Edition Board GAme. Condition is New. Dispatched with Royal Mail Signed For® 2nd Class. Walking Dead Monopoly Sealed Board Game. Condition is New. Dispatched with Royal Mail 2nd Class. Get in the Ring! Your favorite WWE Superstars, events and show stopping tech are all up for grabs. Trade your way to success - you can own it all. DARK FORCES ARE AT WORK! A friend has seemingly vanished. Playing Harry, Ron, Hermione, Ginny, Luna or Neville, you must try to discover WHO did it, WHAT spell or item they used and WHERE the student was attacked. Think you know about Dinosaurs?. Will you identify the assassin in. holders, and special weapons, this is Cluedo like you've. Early Years. With 12 characters and beautifully detailed castle shaped. Throughout history the Assassin Brotherhoos and the Order of the Knights Templar have been waging a secret war. The Assassins fighting for peace and free will, and the Templars attempting to control it. Now the Templar`s grip on the free world is tightening and in their quest for dominance, they have infiltrated the ranks of the Brotherhood. As a loyal Assassin, it is down to you to root out the Templar spies, take back control and free humanity from the Templar`s imposed world order.Play as one of five different Assassin cells as you try to reclaim territories and win the game. Only once all opposition and their potential spies have been wiped out, can you truly defeat the Templars.As you fight... Click here for more details. 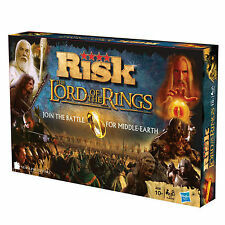 The world`s favourite family board game brings you another exciting edition of MONOPOLY Lord of the Rings Edition Choose your favourite token including Gandalf`s Hat or Aragorn`s Crown, tour your favourite Middle-earth locations and accumulate fortunes, but watch out for Shelob`s Lair, jail and bankruptcy Advance to Bag-End, Rivendell or Farmer Maggot`s will you owe rent or reap the rewards? 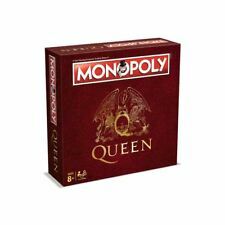 Invest in strongholds and fortresses and trade your way to success The Fast-Dealing Property Trading Game is fun for the whole family Gather your courage and strength as you journey into the darkness to build your empire in Lord of the Rings Monopoly. This Trilogy edition allows you to buy, sell and trade... Click here for more details. Guess Who - The classic guessing game - Various Editions! The universe of Assassin’s Creed puts the fan in the middle of an ancient struggle between two factions – The Assassins, who fight to protect mankind’s right to freedom, and the Templars, who wish to impose a New World Order. General Interest. Need Help ?. We also sponsor a local youth football team. Three Legged Cross. Unit 6 Victory Close. Champion dreams limited. Item Price: £27.49. 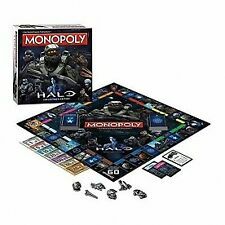 Use your wits to take command of Arcadia, the Covenant capital of High Charity, or even Earth itself. • For ages 8 years and over. What you get. Old Station Way. Unit 15, Bordon Trading Estate. In the event of a cancellation, we urge you to cancel your order as soon as possible, we would suggest within 1-2 hours, because it is likely that we can then retrieve the item before it is despatched. Featuring many of Oxford's most famous landmarks and cultural icons, they make wonderful gifts, souvenirs of a trip, or great family fun with a local flavour. United Kingdom. General Interest. Need Help ?. Now, only she knows its whereabouts. We also sponsor a local youth football team. United Kingdom. General Interest. Need Help ?. Item Price: £23.99.